A child raised in a loving, nurturing and edifying environment develops into a well-adjusted adult. Well-adjusted adults are responsible, not just to themselves but to their community as well. A child raised in a stressful or chaotic environment (where there is abuse, neglect, lack of structure, etc.) develops into a stressful, chaotic, and usually self-indulgent adult. Such adults tend to hurt rather than help their communities. If you desire a healthy future, then you have a vested interest in supporting the healthy development of the children in your community who will be its future leaders. During the first years of life, much of the learning children experience happens in the course of everyday family interactions and experiences. The ways parents touch, look at, and talk with them from earliest infancy affect their physical, cognitive, social, and emotional development. This is why it is important for parents to look beyond what they do with their children to “how” they do it – to the attitudes and feelings that underlay their actions. For example, if a mother enjoys reading to her child, the child senses this and learns that reading can be a pleasurable experience. However, if a mother feels anxious or distracted while reading to her child, the child may pick up on those feelings of discomfort and infer that reading is an unpleasant task. It is also important for parents to realize how much they teach their children simply by the behavior they model. 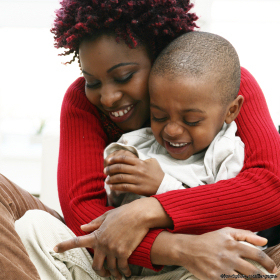 Children learn primarily by observing their parents in daily life, as well as from what the parents try to teach them. Many parents today became parents as children. As a result, few of them finished the development, nor acquired the knowledge, necessary to become effective adults. So, they are teaching their children what they know – how to be dependent (a child) rather than self-sufficient (an adult). They see parenthood and adulthood through the eyes of a child. When one becomes a parent while still a child, (s)he does not recall a parent’s nurturing and teaching so much as their provision and rules. In addition, (s)he is more than likely unaware of the purpose behind these, but rather just receives them as a normal part of life. So when (s)he becomes a parent, if (s)he is still not looking to be provided for, (s)he perceives that parenting is providing for your children – and that’s it. Oh yeah, and disciplining them. But there is so much more to parenting. And this is what today’s parents need to learn. And what IPI provides them. For further information on parenting today, click here. To deliver parenting education programs, supports, and public awareness initiatives that advocate for prevention of the parental maltreatment of children, a known precursor of the social, health, and behavioral outcomes that prevent children from reaching their full potential. To learn more about the Campaign, click here. If you have a heart for the community, for your future, for our children – then IPI, a 501(c)3, may be an ideal destination for your beneficence – from money, to time, to in-kind donations. The more you put into IPI and its efforts, the more the community benefits as lives are improved. But no matter your type or level of support, remember, because of your input, the world is becoming a better place for all. Contact Us | INVEST | Donate Today! Indiana Parenting Institute, Inc. is designated a 501(c)3 not-for-profit organization. All contributions are tax deductible to the fullest extent of the law.